Anyone in the custom picture framing industry or owners of galleries selling art or photography can benefit from SwingFrame Mfg’s patented swing-open frame and display products. As you explore this website you will see many exciting and unique framing solutions that use the SwingFrame system.What that means for you is there are new sales possibilities with your existing customers and a great opportunities to expand into new markets. Numerous industries and institutions including Retail, Hospitality, Schools and Universities, Financial, Healthcare and Medical Facilities, Restaurants, and Government Agencies need to update their marketing, signage and other printed materials including: posters, notices, advertising, menus, employee of the week awards, directories, photography, licenses, compliance posters, sales and other announcements. 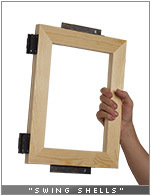 Standard picture frames are permanent and materials are not easily changeable. It’s a hassle just taking the frame apart and then re-assembling it. One location can have several or even hundreds of frames that need materials changed. This can be time consuming and costly to your customer because someone has to do it. 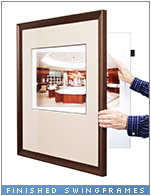 Swing-open, rapid change frames are an alternative to standard picture frames that can help make the sale, especially if your competitors are going after the same customers with traditional framing methods. When making a call, bring a small SwingFrame sample with you. Swing-open, place or change the printed piece or item and Swing-close. It’s that easy! Just demonstrating how simple the SwingFrame works can help convince new customers to place an order with you. Thousands of companies have already purchased SwingFrames. Endless custom framing opportunities are waiting for you. Companies in all industries are always looking for ways to present and quickly change their advertising, announcements, promotional items, and materials. Show them how, by purchasing a small SwingFrame sample, to see how easy it works and then present it to your customers. Because SwingFrames do more, you can charge more. For more sales and bigger profits start by quickly changing the way you do business. SwingFrame Mfg. offers complete ready to hang SwingFrames in over 15 standard sizes. We offer metal and wood profiles and can custom build a display up to 48” x 96”. We have our own standard metal frames (wide-face 1” profile) and use other industry brands names including: Nielsen, Designer, Global Art, as well as wood profiles from Studio Moulding, Larsen Juhl, Décor, Omega, and Framerica. Discounts are offered to Custom Framers, Corporate Art Services and Consultants. We build it and ship it, while you profit from it! standard sizes and can custom build any Swing Shell size up to 48”x 96”. Swing Shells can also be built with depth to create shadowboxes.